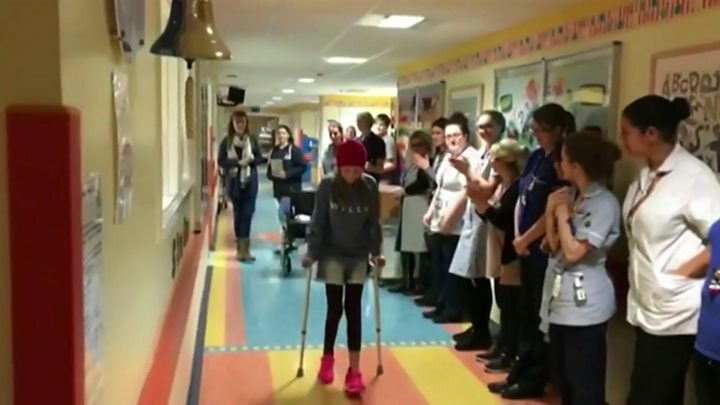 A 12-year-old girl has taken part in an emotional ceremony to mark the end of her chemotherapy at a hospital. Alice Rossington, from Grantham, Lincolnshire, was diagnosed with a rare form of bone cancer in February. During her eight months of care, part of her femur needed to be removed. At Addenbrooke's Hospital, Cambridge, staff who cared for her formed a 'guard of honour' and cheered as she rang a bell signalling the end of her treatment. A video of the ceremony has been viewed thousands of times online, with BBC Radio 2's The Chris Evans Breakfast Show dedicating the programme to her on Tuesday morning. The video ends with a speech from Alice's mother Victoria, who thanked NHS staff for putting their "arms around us the whole journey". Her family said she's "feeling stronger each day" and will now need about six months of physiotherapy sessions. Nick Rossington, Alice's father, said: "We initially thought it was growing pains, the thought of cancer hadn't crossed our minds. "When they said it was a tumour it was just a complete shock." Osteosarcoma affects about 30 children in the UK a year, according to cancer charity Macmillan. Mr Rossington continued: "She's taken it in her stride, she has been like, 'this is a job I've got to do, let's just get on with it'. "As she was scheduled for 29 weeks of chemotherapy, we were ticking them off and it seemed like we were never going to get there - it's now a feeling of relief, we can be together as a family and bring some normality into our lives." Responding to the success of the video online, he said: "You see so many sad stories, but this is a really positive one. "It's great for the staff there to see how good their work is and what it means to us."